Everyone who is lucky enough to share their life with a dog knows the benefits of their companionship. But I recently had the opportunity to see how even a brief interaction with a dog can brighten the day of a complete stranger when I was invited to come along on a pet visit by the local organization People Animals Love (PAL). PAL is a D.C.-based non-profit whose mission is to harness the bond between humans and animals to create social change. Through their pet visit program, they coordinate volunteers and their dogs to visit more than 10,000 people each year at 30 nursing homes, hospitals, libraries, and mental health facilities in D.C., Maryland and Virginia. While both my dogs are friendly to people and other dogs, I thought Chatham’s laid-back attitude would be better suited to a nursing home. So on a Saturday morning I brought her to the Goodwin House retirement community in Falls Church, Va., where I met up with the PAL Group Leader Stephanie and Colleen Mallon, corporate director of marketing for Goodwin House. Colleen told me that PAL volunteers visit the facility the second Saturday of every month, and that residents can sign up for individual visits in their rooms or go to the designated area for a group visit. She said that it’s a very popular program, on average more than half the residents will come to spend time with the animals. Only dogs were along on this particular visit, but the PAL program allows other pets including birds, guinea pigs, hamsters and rabbits. Lorene talks to PAL Group Leader Stephanie while hugging toy poodle Coco. 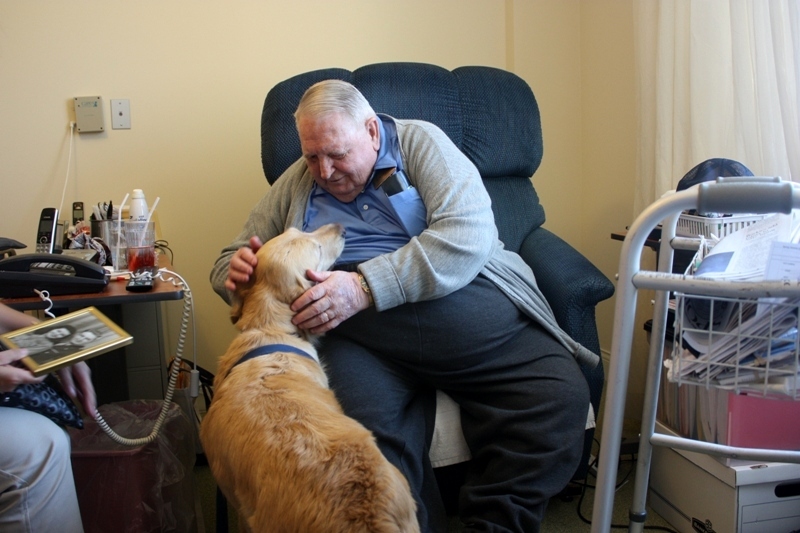 Goodwin House is very supportive of the benefits pets can bring to its residents. The Falls Church location has allowed residents to bring their pets to live with them since January 2010 (about five live there now), and the Alexandria location just began allowing pets this June. 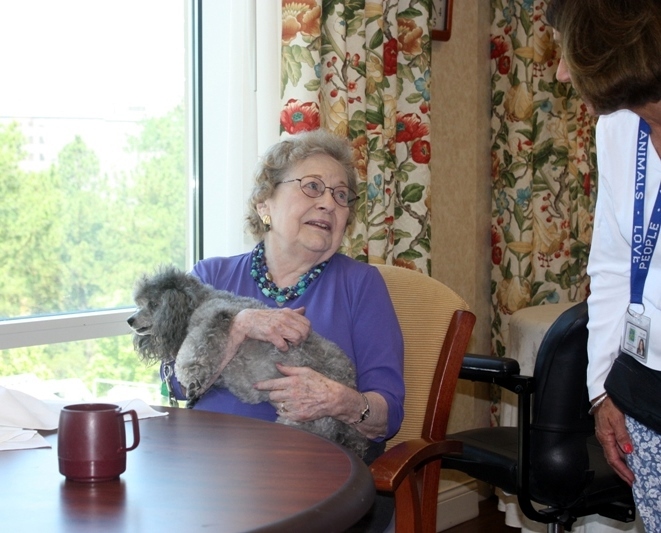 Families can also bring pets to visit residents. I have to say one of my biggest fears is someday having to live in an assisted living facility, and not being allowed to have dogs, so I’m very happy to see there are places like Goodwin House! There were about a half dozen PAL volunteers on the visit, both men and women who brought a wide variety of dogs ranging from a toy poodle to a 75-lb. mixed-breed. We spent time first with Della Rand, who moved to Virginia from Pittsburgh to be closer to her daughter. 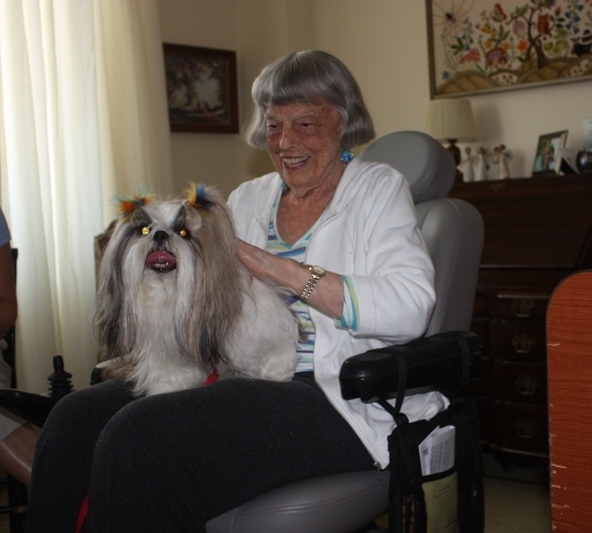 It was Della’s first time having a PAL visit, but she gladly took Mimi, a Shi Tzu with colorful ribbons in her hair, on her lap. Della told us that she used to be a therapist, and that she’d always had dogs. Her most recent dog was a white poodle named Maggie who now lived with her granddaughter. Then we met with Louis Cyr, who has lived at Goodwin House for nine years. As he stroked Chatham’s head and bent down to kiss her nose, he told us about his daughter’s yellow Labrador and Jack Russell Terrier. Louis pets Chatham during the PAL pet visit. Finally we visited Lorene Mann, a Northern Virginia native who held and hugged toy poodle Coco while talking about her son’s short-haired Daschunds. Colleen said that the visits relax the residents, and are a huge benefit for memory support in particular. That was evident as every resident we visited reminisced about their experiences with past pets. It felt great giving just a little time and listening to their stories. Chatham behaved well during the hour-long visit, despite at first being hesitant to enter the elevator and timid around the motorized wheelchairs. She quickly relaxed and laid down in each room, however, and the smaller dogs were very comfortable sitting on the residents’ laps. PAL currently has more than 360 volunteers visiting 30 facilities. Most PAL pet visits (85 percent) are to retirement homes, but they also work with children, schools and mental health facilities. Participation as a PAL volunteer is relatively easy, extremely rewarding and there is no required time commitment. Information and a downloadable orientation package are available on the New Volunteers page of PAL’s website. Special thanks to Paul Julius who took the photos of the PAL pet visit. Thanks for your wonderful story and for acknowledging the wonderful PAL volunteers to give so much time to Goodwin House and provide such a wonderful service to our residents.